Excuse Me, Do You Validate? You know how they say, “Everything happens for a reason”? Well, I think we can all agree that at times, it’s hard to imagine what the reason could be. All the struggles and heartache serves a purpose. It’s like you parked your car in a pay lot, but with validation you get to park for free. 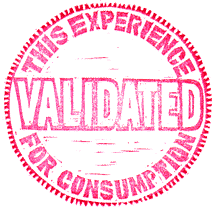 The trouble is, you can’t seem to find anything to buy to get that coveted validation stamp. Today wasn’t a particularly hard day, but I left work frustrated. Most of my frustration came from not being able to complete my prioritized task list. What can I say, I get a rush from checking all the boxes on my list by the end of the day. I felt like I had let people down (whether that was true or not) and that I didn’t have the rock star day I had set out to have. I put a lot of pressure on myself to be efficient and when efficiency falls victim to necessity, I get unhappy. So anyway, I left work with a little attitude about how my day had gone. I was eager to get home, play with my puppy-faced roommate, eat and go to bed, but then life gave me a validation stamp. I got a message from a friend. My friends relationship had taken a turn for the worst and she was looking for advice. I called her back and she told me she was getting a divorce. It was his choice, not hers. She said she wasn’t sure how to cope. She said she had had enough people tell her “everything will work itself out. His loss, someone else will be lucky to have you”. A lot of cliche lines that don’t make sense to a broken heart. She was tired of people telling her everything happens for a reason and she just needed to know the truth. Was she going to be able to handle getting divorced? There was a long pause on the other end of the phone. I was sure I had been too honest when I heard an exhausted “thank you”. She said it was nice that she didn’t have to be okay yet. That she didn’t have to see the bright side just yet and that someone could admit to her that what she was going to was pretty “sucky”. We talked for nearly an hour about the ups and downs of the dramatic life change that is divorce and when I hung up the phone I had a familiar feeling. This wasn’t the first time that someone had reached out to me during relationship struggles, since my divorce. And each time I have responded in a similar manner. Each time, after the conversation is over, the same feeling fills me up. I don’t quite know what to call the feeling because no word really seems right. I don’t want to say pride, but I am proud that my experiences have allowed me to give support and guidance to people I care about. I don’t want to say validation because it seems selfish that other people’s misfortunes could somehow validate my own. My consequential wisdom was earned not by choice, but somehow, I am glad that my past has given me the opportunity to help people navigate their own rocky paths- validate their feelings in some way. Don’t get me wrong, I consider myself an optimist, but sometimes, the positive is in allowing yourself to feel and work through the negative. And sometimes even though the blatant truth seems cruel to acknowledge, it may be all that person really wants to hear. Be honest. Be brave. Be kind.